The Rhode Island Department of Environmental Management, Division of Agriculture is accepting grant applications for the Local Agriculture and Seafood Act Grants Program. The goal of the program, which was established by the Local Agriculture and Seafood Act (LASA) of 2012, is to support the growth, development, and marketing of local food and seafood in Rhode Island. It is made possible by $100,000 in funding from the State of Rhode Island, and an additional $130,000 in matching funds from the Henry P. Kendall Foundation, the van Beuren Charitable Foundation, and the Rhode Island Foundation. This unique and unprecedented public-private partnership will provide grants intended to directly benefit and strengthen the local food system in Rhode Island. More details and links to the application guidelines and instructions can be found on the Rhode Island Food Policy Council site. George’s of Galilee turns back pricing to 1948! While celebrating our 70th year in business! George’s of Galilee has been owned and operated by the Durfee family for 70 continuous years, more than any other restaurant in the area!. In honor of this milestone, we will be offering 1948 prices on all the original menu items from 1948 for the ENTIRE month of January! A cup of chowder for $.25? YES! Its TRUE! Norman Durfee, after graduating from URI in the 1940’s and working as a Cushman Bakery salesperson, was convinced by his wife Edna that he should buy a local shack called “George’s Lunch” because he used to spend so much time there when he stopped in to deliver baked goods. Over the years, sons E Richard and Wayne Durfee had grown the business significantly. And now grandson Kevin operates George’s with the same recipes and philosophy. George’s has weathered the ups and downs of the economy as well as countless hurricanes and Nor’easters to emerge as one of the largest waterfront seafood restaurants in Rhode Island. OVER THE 70 YEARS, we are proud to have helped put Rhode Island on the map for its culinary quirkiness with our signature items such as our clam cakes, our clear broth clam chowder which is now a category of its own, Rhode Island Clam Chowder, fried clams, fish n chips, lobster rolls, and more. GEORGE’S is open all year long, daily at 11 am. In addition to the historical signature items, TODAY, GEORGE’S offer dishes like our popular seafood pot pie, fish tacos, grilled bourbon glazed salmon, pan-seared sea scallops, slow-roasted prime rib and daily boat to plate specials. We have become the place to go for local fish straight off the docks. We strive to work with our local fishing fleet, bringing in local fish that are hard to find on plates at most other seafood restaurants such as scup, tautog, dogfish, monkfish, sea robin, and mahi which they have been catching right off Block Island. GEORGE’S recently won Best Calamari at the RI Calamari Festival in September 2017 for the second year in a row with our signature Hurricane Calamari dish. Come visit us this winter, as we celebrate our 70th year, sit by our fireplace, enjoy a hot spike beverage and 1948 prices!!. George’s of Galilee,— Eat Fish! Love Life! Photo courtesy of by CHLOE. “With its New England charm, growing food scene, and thriving student and artist population, Providence was really a perfect match for by CHLOE. To open our doors on iconic Thayer Street, a quick trip from every major school and university in the area, was a dream. We cannot wait to meet our new customers,” says Samantha Wasser, the brand’s Founder. by CHLOE. sought out a choice Providence location – a charming white brick building on the corner of Thayer Street, surrounded by idyllic Providence architecture and shops. The 2,500 square foot space seats 50. Founder Samantha Wasser’s creative vision for by CHLOE. was brought to life with a bright and airy style, colorful textiles, and a neutral palette boasting pops of color. Its uber famous (check instagram) hanging swing chairs are enhanced by a vibrant tie-dye fabric unique to the Providence location. Diners will take note of funky, eye-fetching wallpapers – one gives a nod to Providence’s bustling collegiate culture with a book pattern; the other, a colorful 90s-inspired squiggle pattern. Other notable décor details include reclaimed wood and hand-painted tiles, banquette seating, a zinc and wood slatted communal table, and blue and white Moroccan tabletops. The expansive menu offers health-inspired items across categories of Beverages, Grab + Go, Salads, Burgers + Sandwiches, Fries + Sides, Pasta, freshly-baked Sweets, and Chill by CHLOE., the brand’s line of ice cream. Each and every menu item is entirely free of meat, dairy, and egg products, as well as of saturated animal fat, added preservatives, and artificial flavors. For customers on the run, by CHLOE.’s full Grab + Go selection will be available with items like Matcha Kelp Noodles with PANATEA Matcha, kelp noodles, cashew cream sauce, almond parmesan, and scallion, Raw Vanilla Bean Chia Pudding with chia seeds, Madagascar vanilla bean, raw almond, cashew milk, and raw agave nectar, and Nicoise Salad with chopped romaine, chickpea tuna, grape tomatoes, green beans, red potatoes, Kalmata olives, and red vinaigrette. The freshly-baked Sweets are not to be missed, with offerings ranging from Chlostess Cupcakesand Old Fashioned Chocolate Chip Cookies to Matcha Blueberry Muffins and Banana Bread. The full line of Chill by CHLOE.’s dairy-free ice cream will be offered with flavors like Raspberry + Cream, Salted Peanut Butter, Kale Cookies + Cream, Ube Smores, Chocolate Chocolate, andCoffee by CHLOE. Alongside fresh pressed juices and smoothies, by CHLOE. will serve beer and wine. Speaking to canine customers, there are vegan Pupcakes and Dog Bones available for purchase in store. Brunch will be offered on weekends, from 10am to 4pm, offering crave-able renditions of favorites like Mom’s Cinnamon Roll, Quinoa Hash Browns, and The Early Bird with scrambled organic tofu and vegan maple sausage. by CHLOE Providence is located at 223 Thayer Street Providence, Rhode Island 02906. It will be open seven days a week; 11am to 10pm Monday through Friday and 10am – 10pm on Saturday and Sunday. Visit by CHLOE. 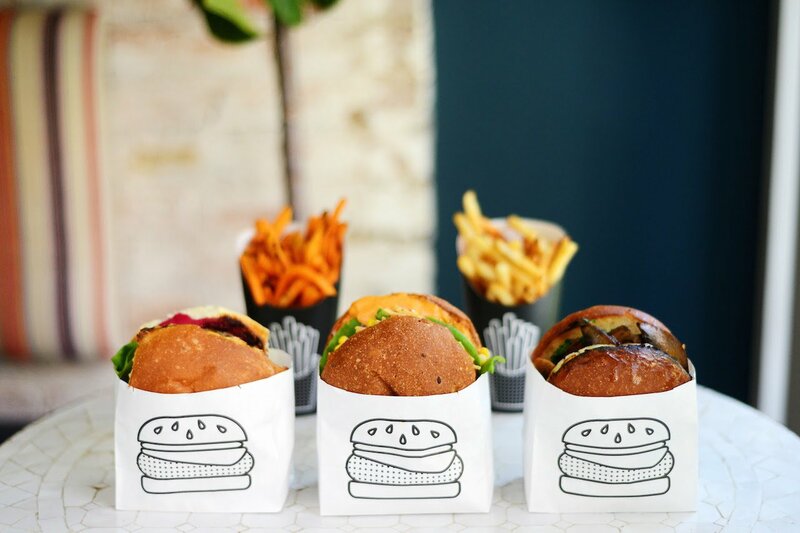 online at www.eatbychloe.com, and on Facebook/Twitter/Instagram/Pinterest/Snapchat at @eatbychloe.